Houses & Homes VA: Do those electronic pest control devices actually work? Do those electronic pest control devices actually work? I’ve been seeing the commercials on TV since I was a child. All you need to do is plug the little “magic box” into the nearest electric outlet and presto, your problems are solved! 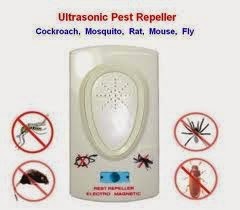 No more mice, rats or roaches and no need to use dangerous pesticides or poisons throughout your home. I always wondered if these devices really do work and decided to do a bit of research on my own. The first thing you need to know is that there are two different types available on the market; ultrasonic and electromagnetic. The ultrasonic type emit high frequency sound waves that are not audible to people but can be heard by certain other animals including rodents. Our friend the cockroach does not hear sound the same way that we do but is able to “sense” sound via its genitalia. Electromagnetic devices claim to “annoy” certain pests and rodents by affecting their central nervous system. This includes ants, spiders and mice. Numerous tests of these devices have been performed over the years and the results have always been mixed. A study performed at Kansas State University confirmed that ultrasound devices do have an effect on certain pests (such as crickets) but no effect on others including ants, spiders and roaches. In addition, some of the devices tested had no effect at all. In 2002 a study performed by Genesis Laboratories showed results that mice were somewhat deterred from areas that were using electronic repellant devices. It may or may not be important to note that the sponsor of the tests was a manufacturer of these types of devices. A company named Victor Pest was able to obtain favorable results from independent researchers that resulted in the registration of 2 different devices with the Canadian version of our EPA known as the PMRA. The test results showed an efficiency rate of about 81% and it took an average of 6 days for the rodents to stop visiting the site. While interesting, these results are not that exciting if you have rodents in your kitchen today. Although previous results have not been very impressive, there is a new theory currently being tested at Washington State University, the University of California and the USDA’s Agricultural Research Service. Studies show that RF (radio frequency) energy has the ability to cause insects to produce more thermal energy within their bodies. In short, they might overheat to the point that they simply run away from the area that is affecting them in this manner! I do wonder if such a device would affect pets or even people but for now we will simply have to wait for the test results. The bottom line for now is if you have a problem with insects or rodents in your home, your best bet is still a call to the local exterminator.